It may not be as crazy as HoloLens, but it's still pretty damn cool. 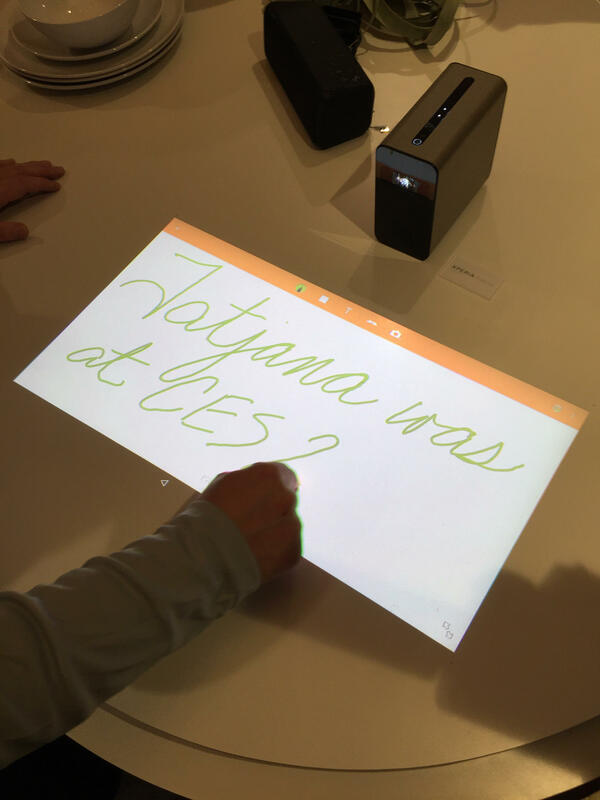 Last year’s cool Sony Home gadget was the incredibly portable mobile projector. It had latency-free auto-focus, and could expand as large as 108″. Very lightweight, and slightly larger and thicker than an iPhone 7+, this projector was (and still is) perfect for camping trips or backyard movie nights. In my house, we use it to project silly videos on our vaulted ceilings. But what if we took that same technology and integrated it with the appliances and mobile applications we use at home every day? Queue in the Sony Xperia Projector, an Android-powered projector with touch technology and more than just a few uses. Adjusting the lighting is fast and easy. Still in its prototype phase, the Xperia Projector (we’ll call it XP for short) is incredibly impressive. 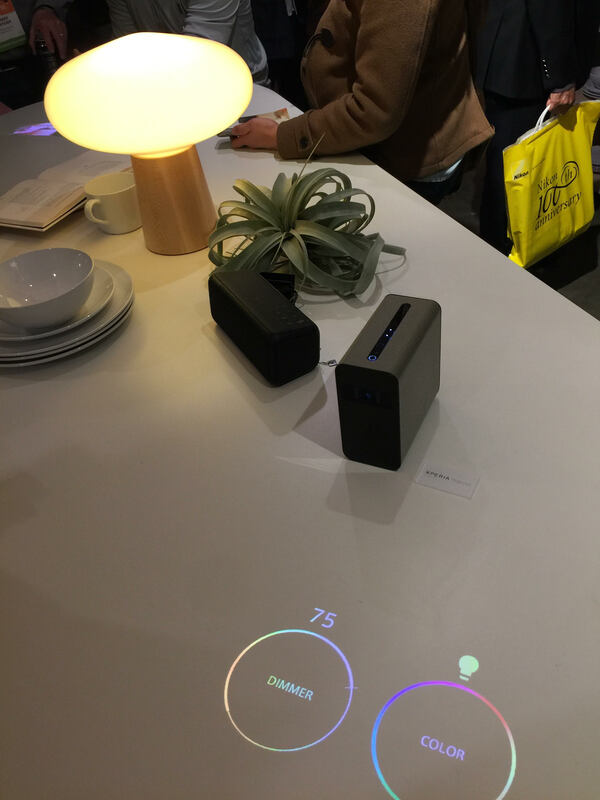 The box-like device projects onto any surface – here, a surface meant to emulate a kitchen counter – and responds very quickly to touch. The simplified menu gives you a few options, such as viewing a clock and calendar, light settings, and music. If you select music while connected to a Bluetooth speaker, XP will load up your library and with the simple touch of a finger, you can change tracks, and adjust the volume. XP also works seamlessly with Hue bulbs (WiFi-controlled LED lightbulbs), allowing you to set the mood for anything from Netflix and chill (which Mickey Renger, the entertaining Sony rep, set to a dim fuchsia color) to relaxing night of reading (a bright yet deep golden yellow). While these features are cool, you might be asking yourself what the point of all this is. As the market is now, there are two types of people: those who enjoy “smart home” technology, and those who honestly don’t care. For the folks who enjoy this stuff, the XP also connects to Sony’s new smart locks. These smart locks, which go by the name Qrio, were originally only for the European market. Shown off at last year’s CES, the locks seemed state-of-the-art in comparison to its competitors. Thanks to the XP, Qrio will be coming to the US (even after its incredibly unsuccessful IndieGoGo campaign). Mickey is quite the artist. Mickey perfectly explained how the XP’s connection with Qrio comes into practical play: “You’re in the kitchen and you’re cooking dinner. You have a friend coming over, they pull up and walk up to the door. By pressing the unlock button on the kitchen counter, you let your friend in, and when the door closes, it locks again.” Instead of having to use an app on your phone in the same situation and getting your dirty fingers on it, you just tap your kitchen counter. Another fun built-in feature is the simple, yet therapeutic drawing function. As someone who owns an iPad Pro and Apple Pencil, I often find myself mindlessly drawing to lower my anxiety and stress levels. The XP’s drawing is just as relaxing, and since it’s more hands on, a lot more fun. If you have kids and need to keep them entertained in the kitchen while you’re prepping dinner, or in the yard while you do some gardening, the drawing application should do the trick! Because the XP is powered by Android, you can use anything downloaded from the Play Store on it as well. If you turn it so the projector faces up, you get a regular projector (for a lack of better terms) to watch movies with – and it can blow up to 80″! To some it may be “just another projector” but Sony’s Xperia Projector is very resourceful. From looking up tutorial videos for something on your worktable to getting the perfect lighting, XP helps us keep our hands off our phones and become motivated to multi-task. No price point or release date have been announced at this time.